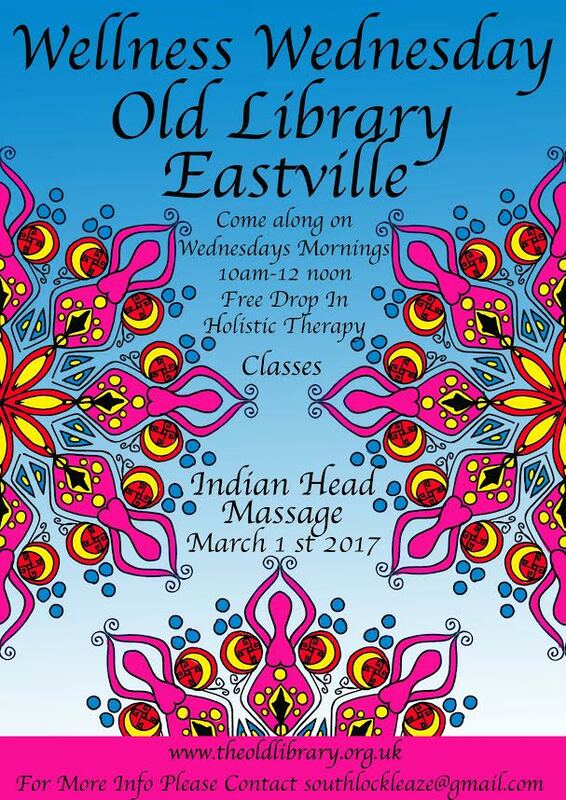 We are really excited to announce that we can now offer FREE holistic therapies classes at the Old Library, Eastville. Our brand new group takes place on Wednesdays from 10-12, led by Irene Buckingham (qualified and practicing holistic practitioner). Our first few sessions will take you step-by-step, learning the principles and the practice of Indian Head Massage, a gentle (clothes on) Ayurvedic massage of the head, neck, and shoulders using essential oils. You will receive a certificate of attendance and hand outs. Please email southlockleaze@gmail.com if you would like to attend, so that we can get an idea of numbers and prepare the right amount of materials. Dress in non-restrictive clothing, and bring a towel and a pillow. In future sessions, we will take a closer look at Aromatherapy and think about continuing the group long term, in whatever direction seems right! Irene is a qualified holistic therapist, practicing aromatherapy, reflexology, Indian head massage, acupuncture, crystal healing, chakra work, and smudging, and is a Priestess of Brighde.